This Solar panel will be a great addition while on a trip. it can fold up to a size of an average guy’s wallet and is partly flexible so you can use it on for instance your bike bags or your backpack. It comes with two AA batteries that can charge in 3 to 4 hours (depending on the sun) and with that energy you can charge your USB devices even when the sun is down. Of course you can also just use the batteries. 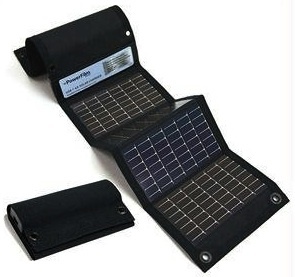 This Solar charger is ideal for trips where sun is plentiful and power not. Check out the Powerfilm Solar Charge USB and AA.